When Abel discovers letters to him from the dad he believed dead, he wonders if magic has come to the hills of Mattingly, Virginia, after all. But not everything is as it seems. With a lot of questions and a little bit of hope, Abel decides to run away to find the truth. But danger follows him from the moment he jumps his first boxcar, forcing Abel to rely upon his simpleminded friend Willie—a man wanted for murder who knows more about truth than most—and a beautiful young woman who was already on the train. From Appalachia to the Tennessee wilds and through the Carolina mountains, the name of a single small town beckons: Fairhope. That is where Abel believes his magic lays. But will it be the sort that will bring a broken boy healing? And is that the magic that will one day lead him home? While this book bellows out an endearing “read me!”, alas, I could not “get into it”, as we book lovers like to say. There seems to be an invisible wall between us and the book, and no matter the force we exert to get over said wall, we fall flat on our butts each time. Here is what I will say, I am not through trying! I respect Billy Coffey as a writer and love his books. So I’m chalking all this up to just bad timing. Soon, very soon, when the moment is right, I will pick it back up again. And I assume it will be magic. I was given this book in exchange for a review. The opinions expressed above are my own. Can vengeance give way to forgiveness when one woman’s destiny becomes entangles with the very enemies she sought to destroy? Motherless and raised alongside her brothers, Alanah, a Canaanite, is no stranger to fighting. When her father and brothers are killed in battle with the Hebrews, she disguises herself and sneaks onto the battlefield to avenge her family. The one thing she never counted on was surviving. Tobiah, a Hebrew warrior, has spent his share of time on the battlefield and is shocked ot find an unconscious woman among the casualties Compelled to bring her to a healer back at the Hebrew camp, he’s unprepared for the consequences of what he intended as an act of compassion. In order to survive, Alanah must unite with her enemy. But will a terrible revelation drive her toward an even greater danger? Have you ever been asked how you liked a book, and all you can come up with is, “It was so so good!”, and then you feel completely ashamed that you can’t come up with anything better to say than that? 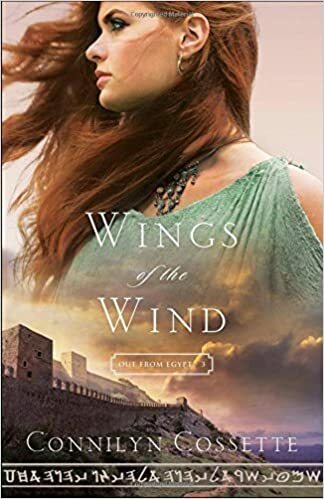 Well, honestly that’s how I feel about Wings of the Wind, Book #3 in the Out From Egypt series by Connilyn Cossette. I’ve made it clear that I don’t read a ton of Christian Fiction because I am leary of the “cheese factor” that accompanies most books *cough, cough*, so I usually approach a Christian Fiction genre book with slight trepidation, careful of not getting too involved, in case my heart should be overcome by all the common tropes and cliches. I digress. I give this book 4 out of 5 stars for lactose intolerant Christian fiction. Cossette should get an award. Seriously. I was given this book in exchange for an honest review. All opinions stated above are my own. Affiliate links used. In a world ruled by magic, she was born to break everything. Born into high British society, Anna Arden has been groomed for a position she will never fill. Through a member of the Luminates- the ruling class who use magic to exercise power- Anna cannot perform the simplest spells. But sometimes, by accident, she breaks them. After drawing unwanted attention from the magical elite, Anna is sent from England to her family’s once powerful but now oppressed native Hungary. Her life might as well be over. But Anna soon realizes that nothing is as it seems. The people around her hold dangerous secrets- from her aloof cousin Noemi to the fierce and handsome Romani Gabor to the magic-wielding Luminates. The society she’s known all her life is crumbling into discontent. And her lack of magic may mean more than she imagines. In the company of nobles, revolutionaries, and Romani, Anna must choose: deny her unique power and cling to the life she’s always wanted, or embrace her gift, spark a rebellion, and change the world forever. Blurbed by Jessica Day George (Silver in the Blood), Julie Berry (The Passion of Dolssa), Virginia Boecker (The Witch Hunter), and Jessica Cluess (A Shadow Bright and Burning), Blood Rose Rebellion promised to be an intense, page turning fantasy that definitely lived up to its reputation. I enjoyed every page! Rosalyn Eves writing and detailed setting descriptions transplanted me back in victorian London, I thought to be a unique setting for a fantasy story which made it all the more interesting. I give this book 3.5 Stars out of 5. I recommend it to anyone wanting to start reading fantasy novels. Eves enters you into a different world without confusing the heck out of you, which on my end is much appreciated. I was drawn to the main character, Anna. Although most books make the main character out to be the hero/heroine straight away, we get to walk through Anna’s struggles with her. To me, that makes the character all the more endearing. I was given this book in exchange for my honest review. All opinions are my own. Affiliate links used.